St. Louis building permits issued for new homes continues on track to out perform 2011 in the largest counties in the area, according to a report just released by the Home Builders Association of St. Louis & Eastern Missouri. According to the report, the counties of St Louis, St. Charles and Jefferson have all seen more single-family building permits issued YTD (through July) in 2012 than in 2011, and Franklin county is only 2 permits shy of where they were in 2011 at the same time. 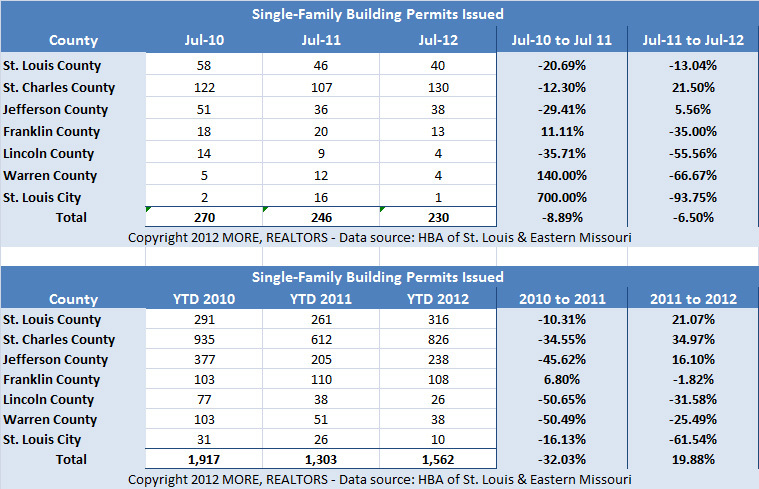 As the table below shows, the smaller St. Louis area counties, as well as the city of St. Louis, are falling behind in terms of the number of building permits issued year-to-date in 2012 compared with the year before, but overall, as a whole, the St. Louis area is seeing increased activity. With new home inventories declining, builder’s confidence appears to be increasing slightly prompting the permit activity we are seeing.